The Uncharted series by Naughty Dog has finally made it to the PS4, and it is a truly glorious return for Nathan Drake. 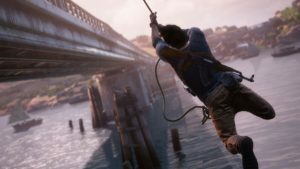 Uncharted 4 chronicles the events after Nate decides to retire from treasure hunting and begin a normal life, but certain events unfold that bring him back into the dangerous life he lived before. I don’t want to spoil much, but the story and characters in A Thief’s End are the best that the series has to offer at this point with excellent writing and storytelling. Nearly every character is engaging with the series’ best villain, supporting cast, and even Nate himself to date. Nate is now a much more relatable character than in past titles.. We are given a much more down-to-earth story about a conflicted man who has to balance to people he loves with his passion for treasure hunting, and it’s a fascinating ride from beginning to end. A Thief’s End certainly keeps many of the gameplay tropes from the original PS3 trilogy, but a lot of new mechanics have been been added to give this entry a lot more depth. Every new inclusion from the amazing grappling hook, to the new all-terain vehicle and boat used to explore the series’ biggest environments to date, add an extra layer to the already fantastic action-adventure series. For the first time in the series, stealth is a viable option when encountering enemies. Whether you’re fighting the enemy armies with guns blazing, or taking them down one-by-one in the tall grass, every encounter is intense and supremely satisfying. The only true issue with A Thief’s End is its pacing. Although the first few chapters have some entertaining platforming and fascinating story bits, the game takes about 9 or 10 chapters (out of 22) to really pick up. However, when the game does pick up, it features some of the most mind-blowing sequences in any single-player adventure to date. A Thief’s End is by far, graphically, the best looking game out there. From the incredible character models, to the beautiful vistas that stretch out for miles (I couldn’t help but stop myself occasionally to look at the beautiful scenery), this game will be the standard for AAA game graphics for years to come. 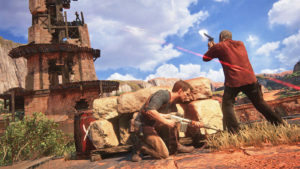 There’s also an incredible soundtrack and a huge improvement in sound design taken from The Last of Us, which is really nice to finally see in the Uncharted series. Whether you’re an Uncharted fan already or just looking for a fantastic game to play on your PS4, pick up Uncharted 4: A Thief’s End immediately. If you give the game a few hours to show you what it truly has in store, it will be an unforgettable experience. 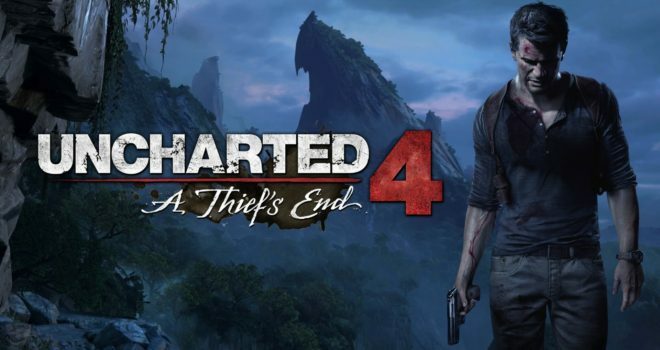 If Uncharted 4 is truly Nate’s final adventure, with how incredible the vast majority of this title is, I really can’t say that will be a disappointment. Oh, and there’s multiplayer. It’s fine, but this is a game that really didn’t need it. It’s an unbelievable 12-14 hour single-player romp that really needed no further additions. Uncharted 4 is worth the price of admission. Well done, Naughty Dog, you’ve shown the power of the PS4 and your own game-design mastery once again.